Lake St Louis "Lake Rights"
Have you ever hear the term "lake rights"? Do you know what it means? When searching for a home in Lake St. Louis, it's important to know that not all homes (and homeowners) have access to all the amenities that Lake St. Louis has to offer. The two lakes in the city of Lake St. Louis are privately owned by the members of the Lake St. Louis Community Association (LSLCA). The LSLCA was formed to maintain and administer the Lake St. Louis amenities and provide services for the community. The community association is funded by an assessment on all property within the LSLCA membership area (currently $600 annually for new residents). 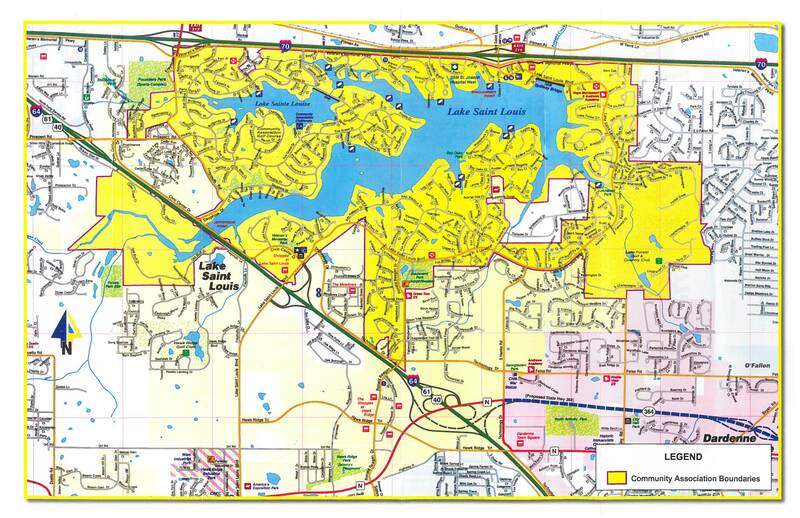 Originally all owners of property inside the city were automatically members of the LSLCA; however, as the city grew, the need to prevent lake overcrowding resulted in newer residential developments not having membership in the LSLCA. Since the lakes, as well as the country club, marinas, and several park areas, are private property of the community association, they are not available for use by non-members. This means that many residents of the city are not permitted to use the lakes, because their property is not covered by LSLCA membership. If you are searching for a home in Lake St. Louis and want to take advantage of all the amenities that the community has to offer, you need to search for a property that is inside the LSLCA. Take a look at the image below to see the boundary lines for the community association (click to enlarge). If you are searching for a home in Lake St. Louis and you are unsure of it's inclusion/exclusion from the CA, ask a professional. Be sure to use a Realtor with knowledge of the area and who can give you good advice based on knowledge and experience. What does Lake St. Louis Have to Offer for CA Members? Lake St. Louis is a great community to live, work and play. CA members have access to two lakes (the "big" and "little" lakes). The big lake is great for boating, waterskiing, wakeboarding, fishing and more. The little lake is more relaxed and is good for kayaking, swimming and fishing. The community association building has a bar & restaurant and meeting rooms available to member for various events. There is tennis, a pool, beaches and a Par-3 golf course. The CA has over 39 recognized clubs with 1,800+ members. The clubs include everything from boating, fishing, card playing, birding, knitting, mah jong, ping pong, ski club and more.